Though fresh attempts were being made in the reign of Charles II to strengthen Britain’s currency, these efforts did not prevent the monetary crisis of the 1680s which saw a fast decline of England’s currency on the international exchange markets. The basic unit of account was the pound sterling defined as the equivalent of 240 pennies sterling silver (containing 92.5% Silver, 7.5% copper). The traditional pennyweight (known as dwt) was one-two hundred and fortieth of a pound (also known as 1 lb), i.e. 240 pennies = 1 pound sterling. Any reduction in the silver content would result in a fall of the value of the English penny on the international trade markets (import/export) – although in the short term, it meant cheaper goods/services for the King (especially if paying soldiers for military services) or as a method of taxation. Several English kings used this debasement as a way to undermine Irish currency while others minted silver coins in Ireland and used them abroad, thus reducing the amount of silver available for use in the internal Irish economy. Inevitably, the silver content of English pennies also fell as the various kings and their financial advisors tried to invent ways of making their silver deposits stretch a little further. 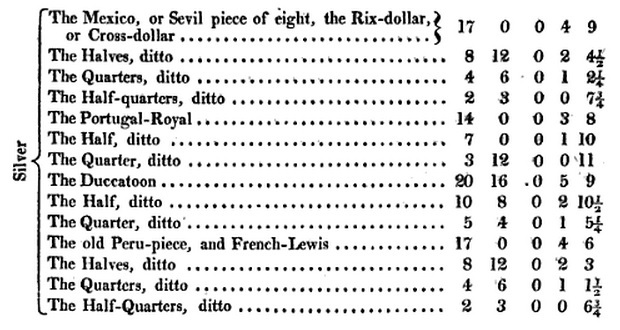 The diagram below illustrates this gradual decline in the silver weight of English pennies over the centuries – until it reached crisis point in the 1680’s and 1690’s when foreign sellers refused to accept it as an acceptable method of exchange. But, as can be clearly seen from the table above, the silver content and the silver weight of English coins dropped by over 66% from the original Anglo-Saxon pennies (and Hiberno-Norse imitations) of the 10th century to the silver coins circulating in the 17th century. Clearly, foreign traders would have had a problem in accepting English coins in exchange for their goods and/or services. If the English King paid his soldiers (on overseas service), they would have had difficulty in spending their wages in those countries and – without the goodwill of the military services – this was a very poor strategy indeed. Worse still, if the English king employed foreign mercenaries to fight his battles in England, Scotland or Ireland (as Charles I did during the Wars of the Three Kingdoms), his commanders would face mutiny and desertions – as did the Duke of Ormonde in Ireland during the Great Rebellion and, later, the extension of the English Civil War into Ireland (the Cromwellian Campaign in Ireland). In addition to the international markets, there was also a considerable amount of foreign gold and silver coins circulating in Ireland and Great Britain from the 17th century onwards, so even in the local markets a pound sterling did not have as much respect as a foreign coin with a heavier weight and/or higher silver content. Something pragmatic had to be done, as opposed to simply declaring that foreign coins were only worth a certain amount in exchange for coins of the realm, i.e. fixing lightweight coins at a ‘higher notional value’ than heavier coins with a greater silver content quite simply was no longer an option. One of the biggest problems in Ireland was the fact that there was no ‘mint’ or banks in Ireland. This meant that traders themselves had to negotiate a myriad of English and foreign coins for the larger transactions, and a plethora of underweight ‘clipped’ silver and local trade tokens for smaller transactions, i.e. economic development was hamstrung. The gold guinea was introduced on 6th February 1663 (1662 on the ‘Old Style’ calendar) in order to support England’s currency and the idea was that gold coins would stabilise at approximately 1 pound of gold to 15 pounds of silver – thus ‘fixing the pound’ sterling against the gold units of the European continental powers. There would be another British currency crisis in the 1690’s when sterling collapsed on the London-Antwerp currency exchange. Meanwhile, back in the 1660’s, most people could not determine the silver content or the silver weight of the coins they used to buy goods and/or services – therefore, a simple system of ‘coin denominations’ that could be readily understood by money users also had to be devised and implemented. Accounts were thus held in pounds sterling – the pound = 20 shillings – and the shilling = 12 pennies. Prior the introduction of Charles II’s copper halfpennies and farthings, all English and Irish coins were minted in either silver or gold (of various quality), except for emergency issues such siege money. In each case, a standard amount of copper, silver or gold had to be used in order to pay for goods or services at a nationally and internationally recognised rate of exchange, i.e. coins had to be seen to have a real value as opposed to a purely ‘notional’ value of modern banknotes. Failure to do so resulted in the coins being rejected by the seller(s). As previously explained, the monetary crisis of the 1660’s was due (at least) in part to a gradual decline in the silver content of English coins over a period a centuries. In addition to this, the political and economic upheavals of the English Civil War, the Interregnum and the Restoration of the monarchy brought the whole issue of monetary stability to a head. Before the 1660s all English coin was produced by hand and was known as “hammered” money. It wasn’t uncommon for unscrupulous people called “clippers” to scrape away small amounts of precious metal from the edges, pass the coin back into circulation, and pocket the illicit proceeds. In currency crisis of the 1660’s and in a bid to halt clipping, the Royal Mint ‘experimented’ with mechanised production, i.e. “milled” coins with a serrated edge that made it easy to detect when a coin had been clipped. However, many older hammered silver coins remained in circulation long after the 1660’s and upon these clippers went on plying their trade. Hammered coins naturally shrank in weight over time, but so gradually that they continued circulating at normal face values – which was way below their bullion value if assayed. Wealthy people (with savings) became reluctant to hold ‘clipped’ silver coins and strove to acquire gold coin instead – as can be seen by the proliferation of foreign gold coins during the 17th C both here in Ireland and in England. In addition to this, anyone importing goods from abroad experienced difficulties when foreign merchants wanted payment in silver – and weighed the coins ! Meanwhile, small traders were grasping the nettle themselves and manufacturing their own small coins for local trade and these are known as Trade Tokens. Most of these unofficial issues contained well below the requisite amount of metal, so the potential for financial mischief was great and Charles II was forced to act. Previously, King James I ordered the production of copper farthings under a licence granted to Lord Harrington, a practice continued by Charles I with first the Duchess of Richmond and then Lord Maltravers. This method was chosen because it was not thought proper for the King to lower himself by issuing copper coins. However, by the time Charles II came to the throne, the private sector had proven its ability to mechanise the production of low value coins and still make a profit, e.g. the many illegal trade tokens of this time. The one big problem that remained was how to withdraw the existing ‘under-weight’ hammered coinage from circulation and replace it with a stable currency based on standardised silver and copper content that would be universally acceptable both at home and abroad. Failure to achieve this would lead to another (much more serious) monetary crisis in the 1690’s that would (ultimately) lead to the painful demise of hammered coinage. August 5, 2015 in 17th C, Charles II, Monetary Crisis.